The cinnamon sugar almond coating adds a wonderful nutty crunch to the crust too. 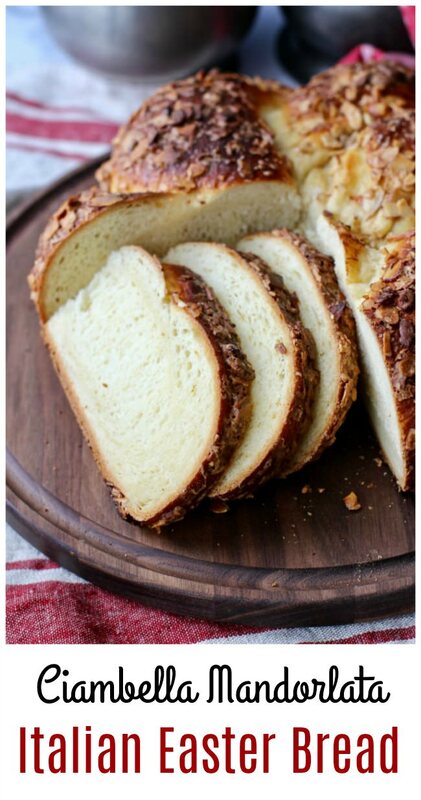 This bread is wonderful for breakfast spread with marmalade or jam. Serve it with coffee (and maybe mimosas) for a tasty treat. A ciambella is a ring cake. In fact, if you drop "ciambella" into Google Translate, you get "donut." You divide dough for this bread into two pieces and roll it into long ropes. Next, you twist the ropes around each other and then join the ends together to form a ring. If you want your ring to have a hole in the middle, make sure that the ropes you form are pretty long (about 20 inches), because the hole will otherwise close when the dough rises. You could also bake the loaf in a ring pan or place an oven proof custard cup in the middle to prevent the "doughnut hole" from closing. I chose to make a fat ring with 16 inch ropes, even though I knew the middle would come together. 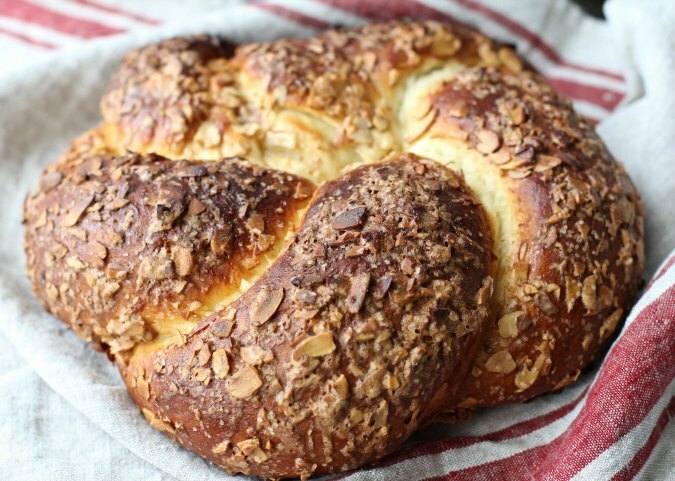 It reminds me of my Demerara Sugar Challah and this Sourdough Golden Beet Braided Bread. This month, the Bread Baking Babes are making Ciambella Mandorlata. Our host is Aparna of My Diverse Kitchen. The dough for this recipe makes a pretty large loaf. While the deflated dough looks pretty small, it definitely has great oven spring. With all of the sugar, eggs, and butter in the dough, the rising time will be pretty slow, so don't worry too much if the dough takes its own sweet time to rise. I was a little worried that my bread was over proofing, but I shouldn't have. The crumb in this loaf was still pretty dense in parts... and maybe could have used a bit more time. My favorite part of this bread was the cinnamon almond egg mixture. You whisk together an egg with cinnamon sugar and some sliced almonds and spread the mixture over the bread with an offset spatula. The almonds get all toasty and the mixture gets all crispy. So good. Be sure to pay close attention to the bread as it is baking. There is a lot of sugar in the topping, which could cause the loaf to burn while baking. If it begins to get too dark, tent the loaf with foil to prevent the loaf from burning. This bread is best the day that it is made. Slice and freeze any leftovers to preserve for toasting later. Leftovers of this bread are also excellent for bread pudding or French toast. In fact, you can make some French toast, cool it, wrap each piece individually, and freeze it to toast later. After the recipe, be sure to check out the rest of the Bread Baking Babes' takes on the recipe. 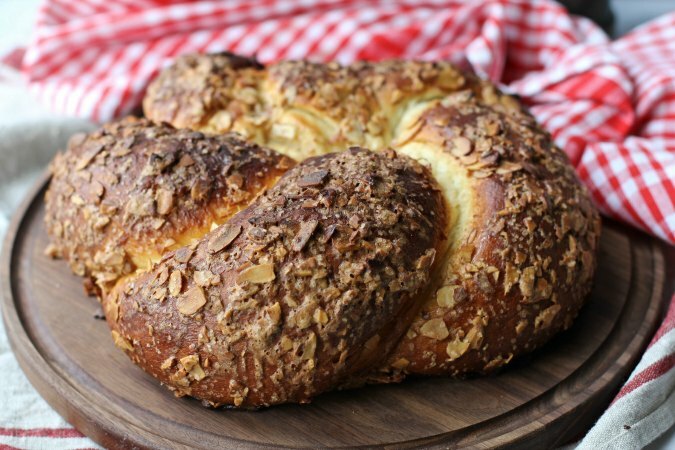 Ciambella Mandorlata is an Italian Easter bread that originated in Bologna in the Emilia Romagna region. In the bowl of a stand mixer, add all of the dough ingredients and mix until you have a smooth dough for about 10 minutes. The dough should be smooth, elastic, and slightly sticky. Form the dough into a ball and place it into an oiled bowl or dough rising bucket. Cover with plastic wrap and let rise until doubled. This could take up to 4 hours. Deflate the dough, re-cover the dough, and let it rest for 10 minutes, covered. Divide the dough into two equal pieces and roll each out into 16 inch ropes. Twist the ropes around each other and place them on a parchment lined baking sheet. Shape the twist into a ring and join the ends together. Cover with oiled plastic wrap and let rise until doubled, about 1 1/2 hours. Whisk together the topping ingredients and spread it over the risen loaf with an offset spatula. Bake for about 45 minutes, reducing the temperature to 350 degrees after 20 minutes. Watch the loaf closely, tenting with foil if it becomes too dark. 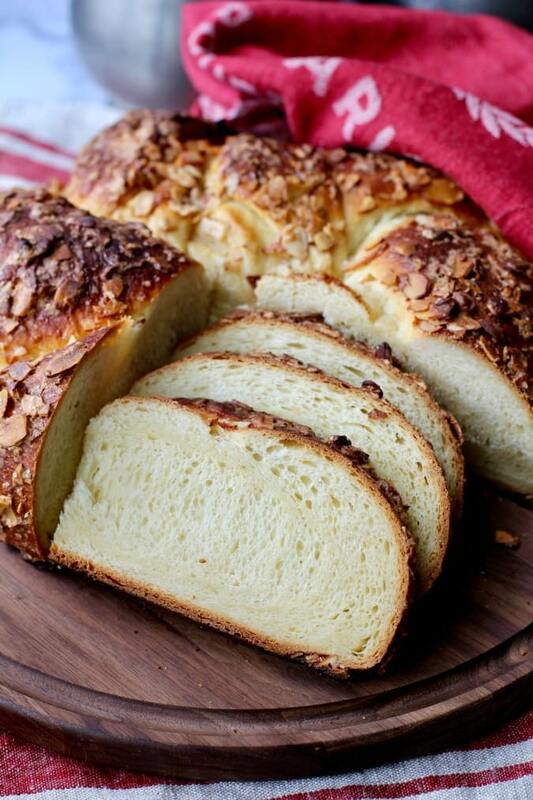 This recipe was adapted from the book Ultimate Bread by Eric Treuille and Ursula Ferrigno. There is also a version in Beth Hensperger's book, Bread For All Seasons: Delicious and Distinctive Recipes for Year-Round Baking. Wow, absolutely gorgeous! The color, the crunch, the crumb, all perfect. Thanks Sally! I'm always nervous with enriched doughs. Beautiful crust and what a beautiful creamy crumb. Thanks for the tips on making French toast. I still need to try that with the leftovers. Your Ciambella is truly "bella". Beautiful.That crunchy crust really sets this bread apart. I love the combo of lemon and almond! Gorgeous crumb!